Now you can start assembling your board. Turn on your soldering iron and give it some time to heat up. Reference your soldering iron manual if you’re not sure what temperature to set it to. Once your iron is heated up, tin the tip by pressing solder into the tip, then wipe away the excess on a damp sponge. 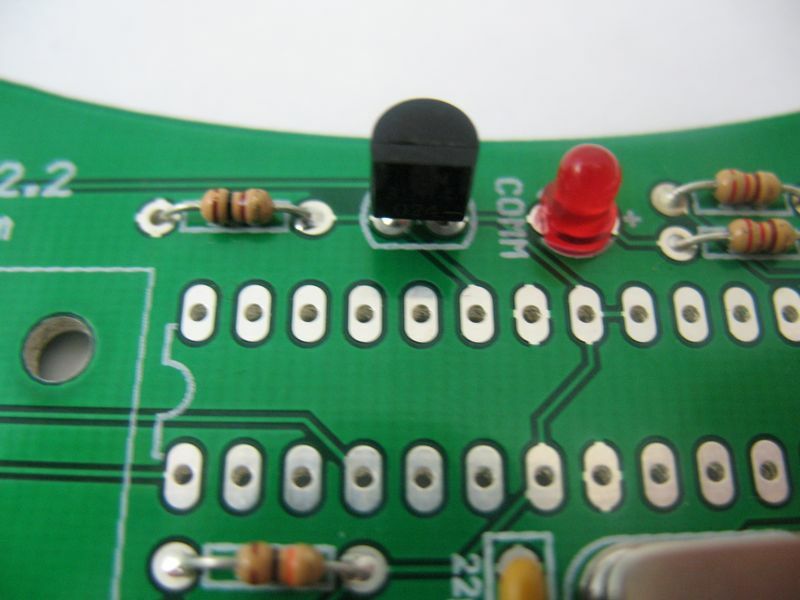 Here’s an excellent video tutorial on soldering we found online. First we’ll start with the resistors. Take the 220 ohm resistor – it’s identified by the color bands “red, red, brown, gold”. Take your needle nose pliers and bend the legs of the resistor 90 degrees each so they’re pointed in the same direction. Find marking for the 220 resistor on the leaf. Slide the legs through the holes. Once the resistor is place, you can bend the legs out slightly to hold it in place when you turn the board upside down. Place the tip of your soldering iron at the joint where the resistor leg and the edge of the hole meet. Press the solder into this junction so it melts and flows freely. Once the junction is covered, remove the iron and solder. Repeat for the other leg. Once both legs are soldered, take your small snips and snip the resistor leg just above the solder. Repeat this process with the other 220 ohm resistor, as well as the two 100 ohm (brown, black, brown, gold) resistors and one 10K resistor (brown, black, orange, gold). Find your LEDs (light-emitting diodes). LEDs are polarized, which means there’s a positive and and a negative leg, so it’s important to make sure that the correct leg goes into the correct hole. You can tell identify the positive side because that leg is longer. 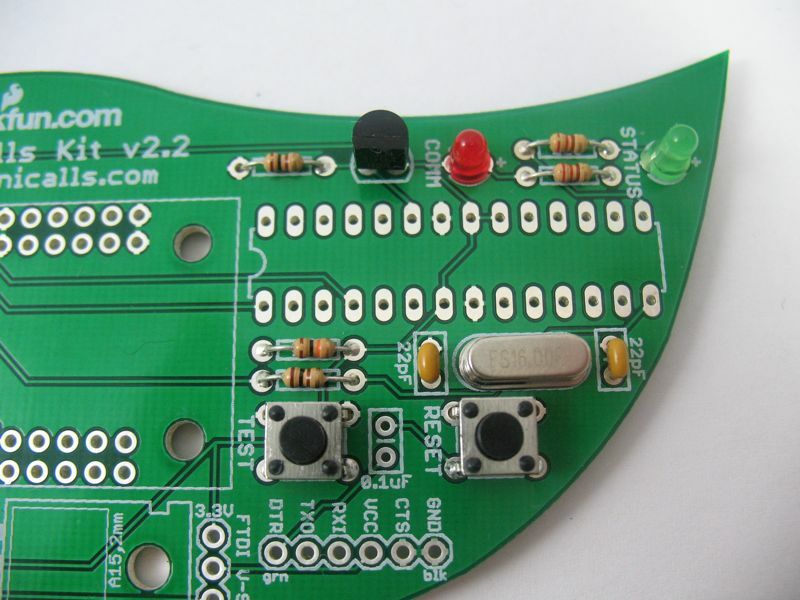 There are two LEDs for your leaf board. One, labelled “status”, will light to give you information about the moisture level of your plant’s soil. The other, labelled “comm”, will light to indicate various communication activity. Take the green LED and insert it into the “Status” light location. Make sure that you put the longer positive leg into the hole marked “+” and the shorter negative leg into the unmarked hole. Once the LED is inserted, flip the board. You can spread the legs on the LED, just as you did with resistors, to hold it in place. Solder and then snip the legs of the LED. Place the other LED in the “comm” slot the same way, longer leg into the + hole, shorter leg into the unmarked hole, then solder and snip. Insert the crystal. There’s no polarity here so it can go in either way. Solder in place and snip the leads. These smaller capacitors are not polarized, so they can be inserted in either direction. Select the 22pF capacitors. They are labeled with “220.” Insert both of these capacitors, solder in place, and snip the excess leads. Take the transistor. Gently bend the center lead out toward the rounded side. Line up the transistor so the flat side matches the outline on the board. Insert the legs and pull through. It may help to use your needle nose pliers. The transistor will sit approximately 1/4″ above the board (see photo above). Solder in place and snip the leads. There are two tactile switches. Only one alignment will fit. They will pop into the board when you press on them. Solder them into place. You will not need to snip the legs because they are short already. This smaller capacitor is not polarized, so it can be inserted in either direction. Select the 0.1µF capacitor. It is labeled with “104”. Insert it, solder in place, and snip the excess leads. Insert the IC socket, noting the notch on the end. Make sure the notch of the socket lines up with the notch on the outline of the board. Use a small piece of masking tape to secure the socket in place. Flip the board. At first, solder only the two pins on opposing corners to secure the socket in place. Check to make sure that the socket is seated flush on the board. If it’s not, reheat your solders and push the socket it. Once it’s positioned correctly, solder all of the remaining pins. When you are finished, remove the tape. There are two sets of 20-pin female headers for the WIZ811MJ Ethernet module. Insert them as shown and use tape to hold them in place. At first, solder just one pin on the end of each row. Remove the tape and check to see that the headers are flush to board and at a straight 90 degree angle. If they are not straight, gently push them into alignment, reheating the solder if needed to move them. Then, solder all of the remaining pins. Note: These pins are close together, so be careful not to use excess solder as it might cause the pins to touch. Insert the regulator in its three pin holes. Slide it so the large hole in the top of the regulator lines up with the matching large hole in the board. Turn the board over and solder the pins in place. Snip the excess. There are two sets of male headers. One has six pins, and the other has only three. Insert the shorter ends of each of the two headers into the board. Tape the headers in place. Turn the board over and solder in place. Straighten if necessary. Slide the black jumper onto the three pin header as shown, connecting the VIN and center pins together. This is the position for using an FTDI programming cable that supplies 5V DC power to the board. Locate the 10µF and 100µF capacitors. These capacitors are polarized, so it’s very important to pay attention to which holes you put them in. The longer leg should go through the hole marked with a “+” sign. The shorter leg, on the same side of the capacitor with the stripe, goes into the hole with the “-” sign. Put the capacitors in place, double-check you inserted them the right way and in the correct position, then spread the legs, solder and snip. Insert the power jack so the opening is facing the edge of the board. Carefully but firmly press the jack so it snaps into place. Turn the board over and solder. Use enough solder so that the holes are completely filled. This will add physical strength to the connector. Turn the board over. 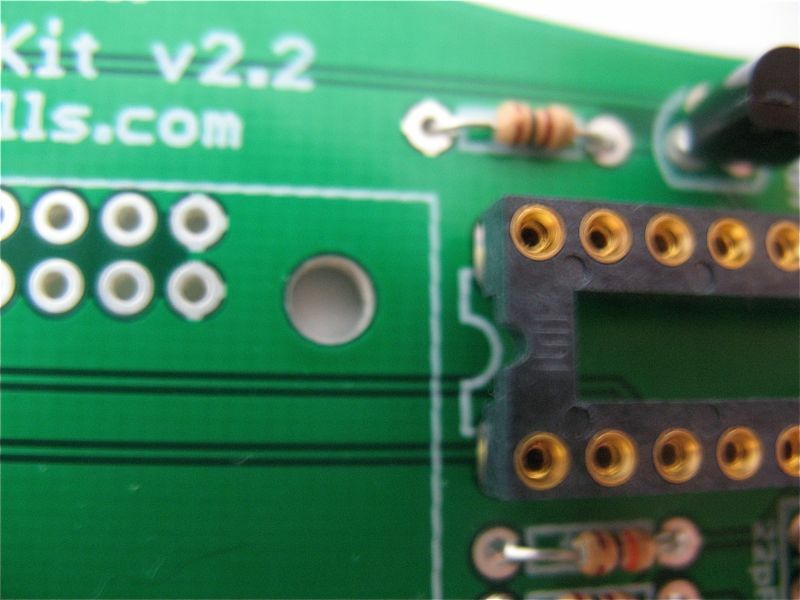 The terminal block gets put in from the reverse side of the printed circuit board, as shown. 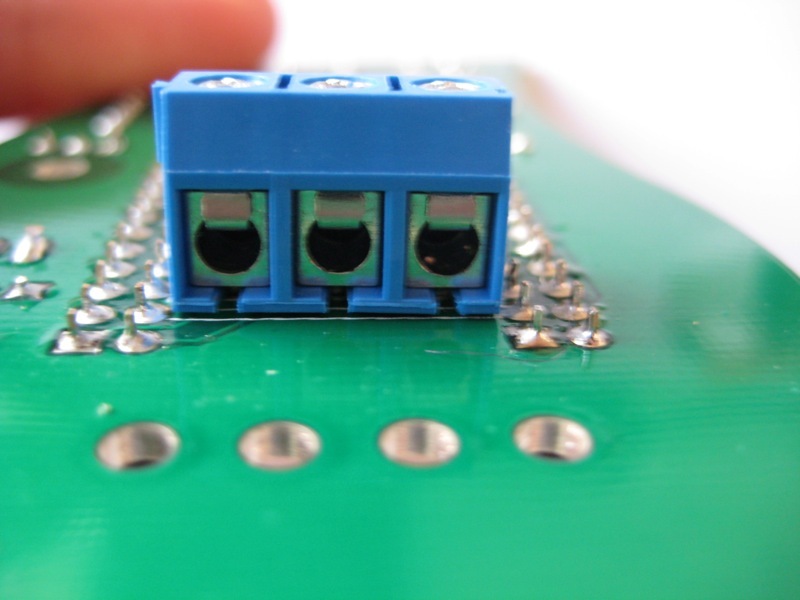 On the back side of the board matching the outline, place the terminal block so the metal openings are facing the same direction as the opening of the power jack. Tape in place. Turn the board so you are once again looking at the front. Solder the leads of the terminal block. Remove the tape. You are now ready to insert the microcontroller into its socket. If its legs are spread too far apart for them to fit into the socket, use a flat surface to help bend them to a 90º angle. Gently press the chip all the way into place, taking care to not bend any of the legs. Using a small, flathead screwdriver, unscrew the left and right screws of the terminal block so that the holes are completely open. Insert the steel moisture probes all the way into these holes. Screw closed the openings to securely hold probes in place. To secure the probes in place, insert the two cable ties through the holes so they loop around the probes as pictured. Pull the tab tightly so that probes are pulled close to the board. Once the ties are secure, snip the excess length. Insert the WIZ811MJ carefully into the female headers with the port facing the edge of the board. Congratulations! 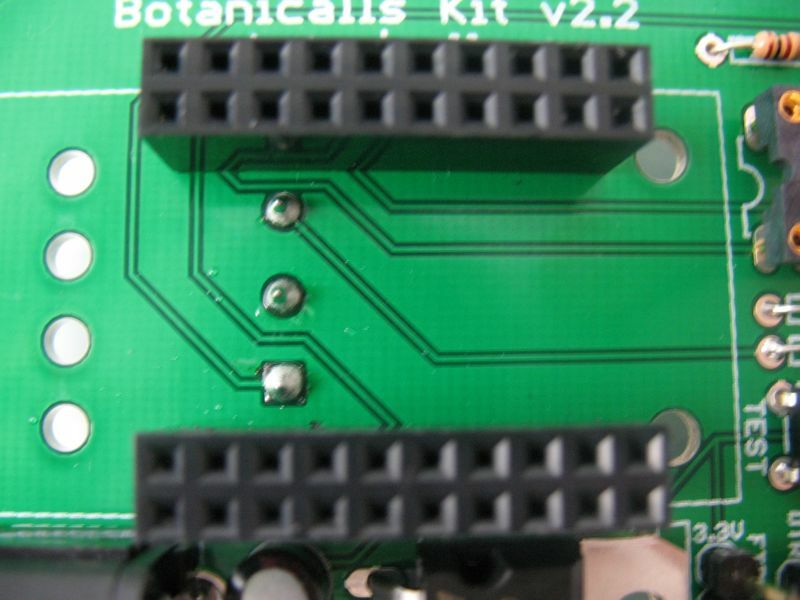 You’ve finished the physical assembly of your Botanicalls kit!